This antenna is rainwater close in its normal vertical mounting position. But take care if your mast can be tilted downwards then rainwater will flow in immediate the connector base is not sealed. Inside the fiber tube there is a long copper wire with two coils. The joint of the 2 C's is the inner pin of the SO239 connector. The Air-coil underside is soldered to the connector house. The antenna is connected to the Tap on this coil through a C ( 8.5pF) I think the base coil and its 2 capacitors function as matching network. Seems a rather small value to me this 8.5pF for 144Mhz. The other C is parallel over the connector i do not know that C value.The 2nd coil must be the usual Collinear section divider for 70cm. 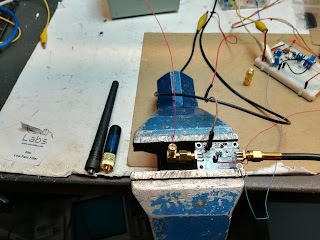 Then in the middle there is an brass tube of about 40cm where the inner conductor goes through but i measured no galvanic connection. I thought maybe that's the problem... Had to force it open to see but there was nothing inside! Just an isolated section? Halve way the wire lead through a 40cm x 10mm diam. brass tube. Both ends are fixed in an 25mm long isolator bus. How does this work? As coupling capacitor then its a very small one of about 2pF per side. Also i have the Diamond MX7 2 N Duplexer inserted that gives another 1-2 dB loss at 70cm But those losses can not explain the weak signal i have at this height and distance? a lightning has burned my antenna X30 and I'm looking for the capacity of the two capacitors. Do you know the capacity of the second one?